Present state: The platforms and station buildings have been demolished but the adjacent goods shed still stands and is used as a car workshop (The Fencehouses MOT Centre). The goods dock is also extant. There is no record of a station at Fencehouses when the line from Rainton Meadows to Brockley Whins opened through on 9 March 1840, however it is assumed to have opened shortly after. In its early days the name was rendered ‘Fence Houses’ but the single word name was used in Reid’s June 1849 timetable; both forms of the name were used indiscriminately in later years. After the Leamside – Durham – Bishop Auckland line opened in 1857 Fencehouses found itself on a busy section of line with passenger and goods trains operating in four directions: to Newcastle, Sunderland, Durham and Ferryhill. Express ‘East Coast’ services between London, Newcastle and Edinburgh passed through Fencehouses until 1872 when they were diverted onto the new East Coast main line from Ferryhill through Durham to Newcastle. Thereafter the route through Shincliffe, Leamside, Fencehouses and Washington was referred to as the ‘Old Main Line’. The main building at Fencehouses station was on the down (west) platform, and Hoole (1985) states that it contained features of G T Andrews’ work but it did not follow his fairly standard designs. The axis of the two-storey sandstone building was parallel to the platform, rather than at right angles as found, for instance, at Brockley Whins. On the ground floor, facing the platform, were two hipped bay windows: a distinctive ‘Andrews’ feature. The ridged roof had a large overhang. A small sandstone single-storey block connected the main building to further stone building, again single-storey but of generous proportions, somewhat taller and with a hipped roof. The whole group possessed sombre dignity, perhaps owing some of this character to blackening of the stone by soot. 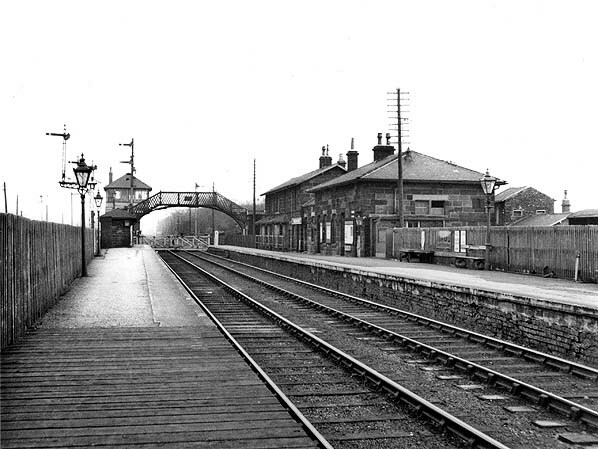 On the up (east) platform, adjacent to the level crossing, was an open-fronted stone-built waiting shed with a hipped roof. At some stage the track side of the down platform was raised slightly and a post-and-rail fence was installed in front of the main building. The platforms were connected at the south end by a footbridge of the familiar NER profile but with close-meshed lattice sides. Goods sidings were placed behind the down platform with access from the north, and a 5-ton crane was provided. Behind the up platform were two separate tracks for mineral traffic, ultimately being used by National Coal Board trains. The signal box was cantilevered-out on both its east and west elevations and stood immediately south of the level crossing, east of the main tracks. It operated the level crossing gates for the two pairs of tracks. The OS 1896 plan shows that a goods shed was in place with a track running through, as well as cattle pens and a loading dock to the south of the shed. At this time Fencehouses was a very small settlement, but the OS plan of 1920 indicates a ribbon development of terraced houses on each side of the level crossing and an auction mart west of the cattle pens. By the end of the 1950s an estate of semidetached houses had been constructed east of the railway. Even though in 1911 the immediate environs of the station were lightly populated the NER claimed that it served 20,485 people – presumably including Houghton-le-Spring. In that year 141,237 tickets were issued. Goods statistics for 1913 record that creosote / tar and livestock were handled. From the 1920s motor buses began to compete effectively with the railway offering more frequent and cheaper services; in north-east Durham they served mining communities without direct rail access, such as Houghton-le-Spring whose residents would previously have considered Fencehouses station, 1½ miles from the town, to be their local railhead. As a result of this competition from road motors while the population of Fencehouses itself grew, the railway station’s passenger traffic declined. In 1923 at the Grouping of Britain’s railways the NER lines, and thus Fencehouses station, were allocated to the London & North Eastern Railway. During the LNER era on the Old Main Line the frequency of passenger services on the line to Newcastle via Washington was reduced and an infrequent service of about half-a-dozen trains each way operated on the route to Ferryhill until it was withdrawn in 1941. Nevertheless in winter 1937-8 Fencehouses enjoyed a high frequency of trains, the majority being on the Sunderland – Durham route. On Sundays there were six up trains -two to Durham and four to Bishop Auckland - and six down trains, all to Sunderland. At nationalisation in 1948 the station found itself in the North Eastern Region of British Railways. By 1951 ticket bookings at Fencehouses had fallen sharply to 21,340 a mere 15% of the figure forty years earlier. By this time the train services to and from Fencehouses via Washington had virtually ceased: in summer 1952 only one passenger train ran south of Washington, calling at Fencehouses at 5.05am on weekdays on its way to Middleton-in-Teesdale. British Railways invested little in Fencehouses station leaving it gas-lit and with LNER signage. On Sundays there were five up trains: three to Durham, one to Bishop Auckland and one to Saltburn (via Bishop Auckland). There were six down trains, all to Sunderland. Passenger traffic surveys were carried out on the Sunderland – Durham line on representative days in summer 1962 and winter 1962-3. The figures showed that passengers from and to Fencehouses dominantly used trains in the Sunderland, rather than Durham, direction. The winter 1962-3 survey found 45 passengers joining trains at Fencehouses on weekdays and 52 on Saturdays, with similar numbers alighting. 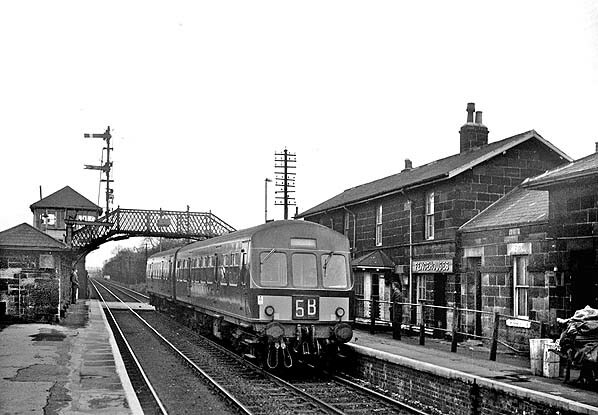 When the Reshaping of British Railways was published in March 1963, Beeching dealt severely with County Durham, recommending the closure of the Sunderland – Durham – Bishop Auckland and the Pelaw – Washington (not ‘Fencehouses’) lines; although the BR(NE) summer 1963 timetable book included a Newcastle - Fencehouses table, only one train ran on the whole route, calling at 5.01am on weekdays en route to Durham. This train did not call at Washington, so effectively there was no Washington – Fencehouses service. Closure of the Washington route was one of the few to which no objections were received, so its demise was swift, formal closure taking place on 9 September 1963. This seems to have caught the timetable compilers napping as the Newcastle - Fencehouses table appeared again in the winter 1963-4 North Eastern Region book. 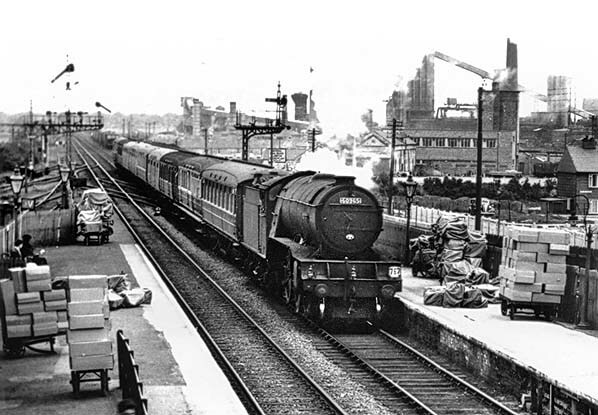 Following the publication of the formal proposal of closure19 July 1963, Ernest Marples, Minister of Transport, gave his consent on 28 February 1964 to the closure of the Sunderland – Durham – Bishop Auckland line, and services were officially withdrawn on 4 May 1964. Fencehouses lost its goods services one month later, on 1 June. The station was demolished within a few years of its closure, but the line through it continued to be used by mineral and goods trains, and for occasional passenger trains diverted from the East Coast main line. 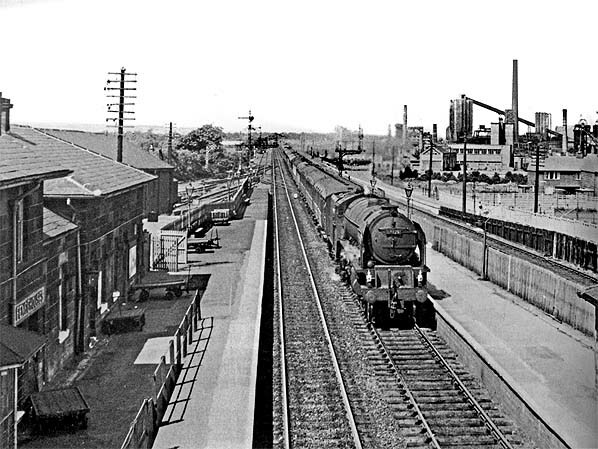 Although the route from Leamside to Durham closed entirely later in 1964 and the connection to Sunderland was lost in 1967, the Old Main Line remained in use until 1991 when British Rail ‘mothballed’ and singled the line from Pelaw to Ferryhill through Fencehouses with a view to possible future use. Various proposals were made to reopen it to passengers, but gradually the line was rendered unusable: some track was stolen and elsewhere lengths were officially removed at some level crossings, and fly-tipping also obstructed some of the route. In 2012 the decision was taken to close the line, and by late February 2013 most of the track south of Penshaw had been removed by rail vehicles, access being made possible by the reconnection of the junction with the East Coast main line at Tursdale, just north of Ferryhill: a correspondent noted a track recovery train topped and tailed by a DRS (Direct Rail Services) class 27 and 47 loaded with concrete sleepers. Nevertheless restoration of the track and services might eventually take place. Tickets from Michael Stewart. Bradshaws from Chris Totty & Nick Catford, Route maps drawn by Alan Young. 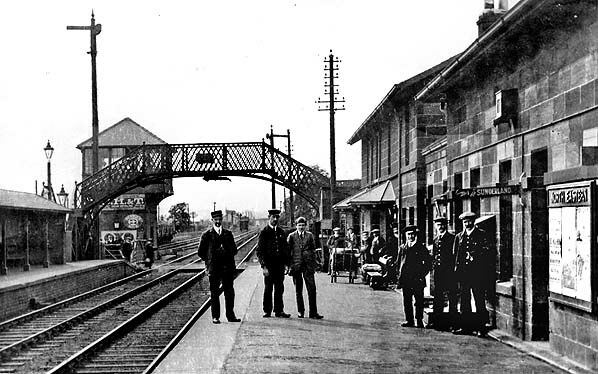 In the early twentieth century Fencehouses station is seen here looking south on the down platform. The G T Andrews’ station building is on the right and an open passenger shelter is provided on the up platform. The footbridge has the standard NER profile but the parapets are of a less common design. 1874 1:2,500 OS map. 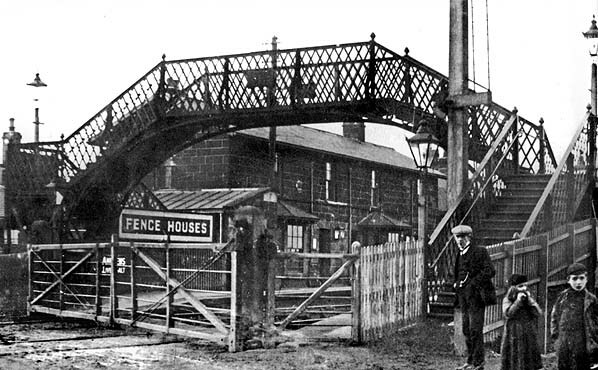 By 1874 Fencehouses passenger station was more-or-less complete; the footbridge is not shown. Goods sidings are provided to the north of the down (west) platform, and a crane is shown in the yard. The Lambton mineral railway can be seen parallel to, and immediately east of, the passenger lines. 1896 1:2,500 OS map. 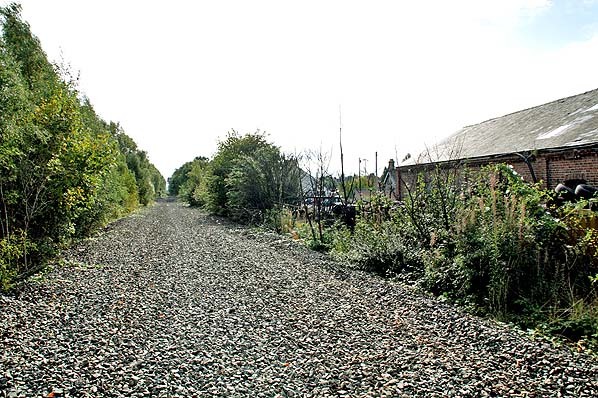 Although its immediate setting remains essentially rural in 1896, the importance of Fencehouses station for goods traffic can be inferred from the sidings and large shed to the north of the passenger facilities and the cattle pens to the west. The footbridge is now shown just north of the level crossing. Although there is little residential development in the vicinity of the station a hotel and a post office have been built next to it. 1920 1:2,500 OS map. Terraced housing has reached Fencehouses station by 1920, and the cattle pens have been joined by an auction mart. NER plan of Fencehouses station in 1906. A proposal to replace the level crossing with an underpass came to nothing. Click here to see a larger version. 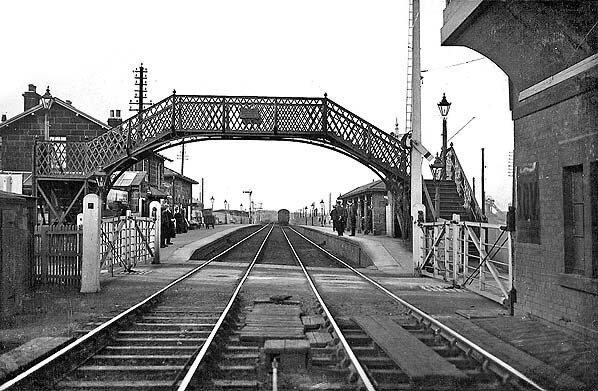 Fencehouses station looking north in the early twentieth century. ‘repeater’ signal on the post in the foreground. Probably in the early 1950s a southbound local passenger train calls at Fencehouses. The locomotive is a Worsdell G5 0-4-4T built at the NER Darlington works in 1896. Its LNER number 7265 was carried until May 1948 when BR renumbered it 67269. After almost 62 years’ service the loco was withdrawn in February 1958 from 54A Sunderland shed. 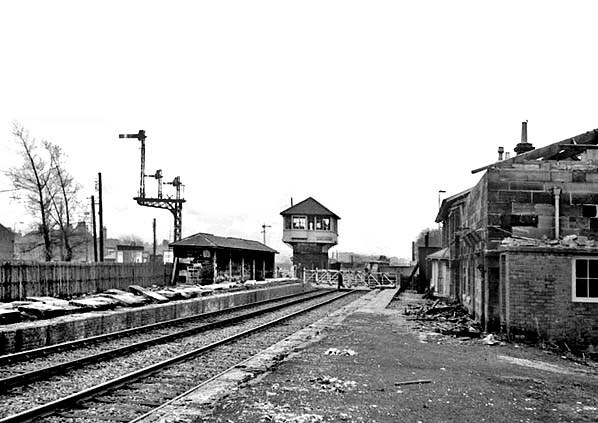 Looking south from the up platform of Fencehouses station in the 1950s. In 1959 a diverted Newcastle to London Kings Cross express is hauled through Fencehouses by Peppercorn A1 Pacific 60129 ‘Guy Mannering’. Built at Doncaster works and entering service on 15 June 1949 at 50A York North shed it had a working life of just over sixteen years, when it was withdrawn from 50A shed on 11 October 1965 and scrapped later that month, possibly at Kings in Norwich. On the right is the double-track National Coal Board (Lambton Hetton & Joicey) main Line from Hetton to the interchange sidings at Penshaw, passing the New Lambton coke works and Lambton ‘D’ Pit. 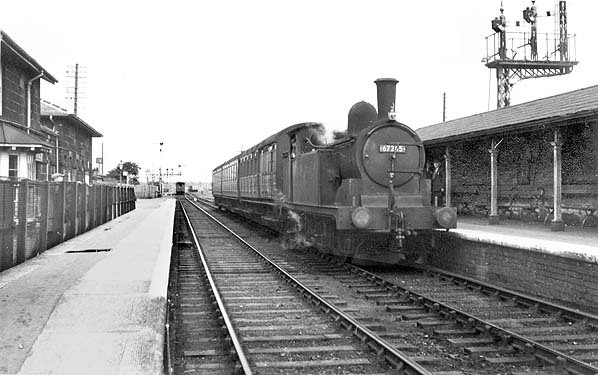 An unidentified loco draws a passenger train southbound into Fencehouses station c1950s. A remarkable quantity of sacks and packages is awaiting dispatch on both platforms. In the background the New Lambton Coke Works and ‘D’ Pit dominate the view. In April 1964 a northbound Metro-Cammell DMU on its way to Sunderland calls at Fencehouses. Closure of the station to passengers is imminent. 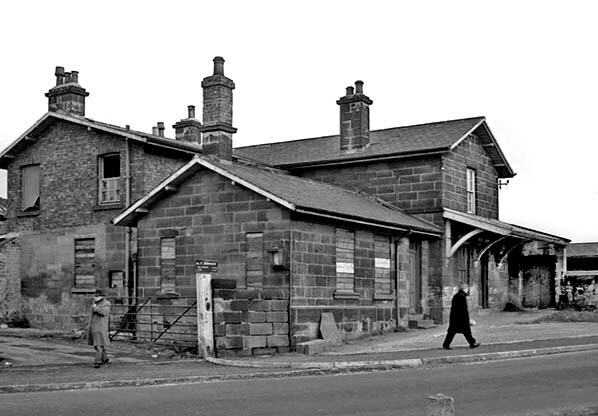 This is the only exterior view of Fencehouses station that has come to light, and the photograph was taken on 5 November 1966 shortly before the building was demolished. Although this station was not given the distinction of a portico, as the architect G T Andrews provided at some of his other stations, a somewhat ungainly awning was provided over the entrance. southward from the down platform. 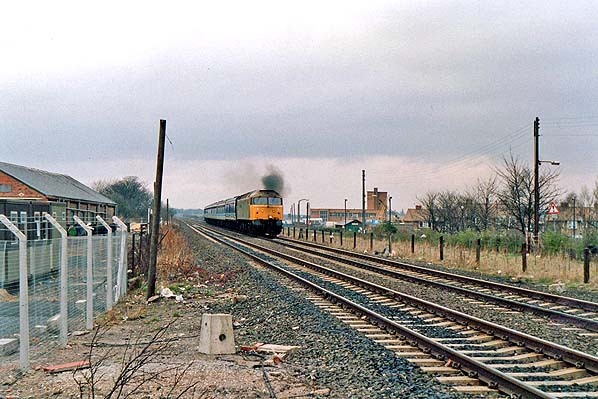 A southbound passenger train, diverted from the East Coast main line, hauled by a Class 47 approaches Fencehouses level crossing in 1991. .The site of Fencehouses station looking south towards the level crossing in October 2013. The track was lifted late in 2012. The substantial brick goods shed is seen on the right; this has found a new lease of life as a car workshop.